Es wurde ja schon oft genug gesagt, auch in Power BI ist das A und O eines erfolgreichen Projektes ein gut durchdachtes Datenmodell. Hier mal ein Beitrag, der aus Sicht vom SQL Server zeigt, wie so ein Designprozess aussehen kann. 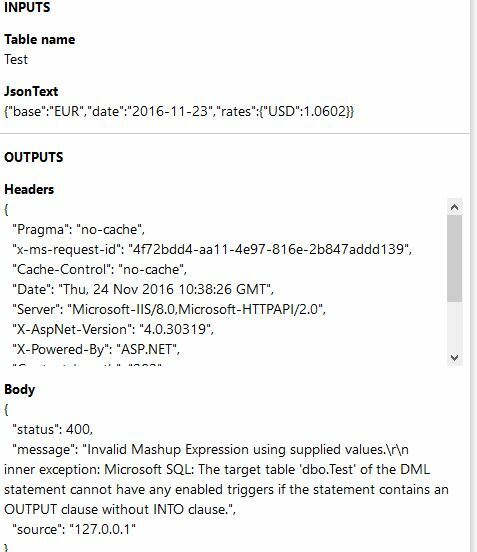 + Parse inserted Json Data with a stored procedure and insert results in our final Currency Exchange Rates Table. HTTP: I’m using fixer.io to get my data. No Problem so far. Insert Row: I have installed and configured the On-premises data gateway and it’s working. Sadly up to now stored procedures are no supported when using a gateway. But hopefully we get this feature soon as stated here. After some investigation, I found this thread. Currently you can’t use the Insert Row action on a table with an existing trigger. So, this is really bad. 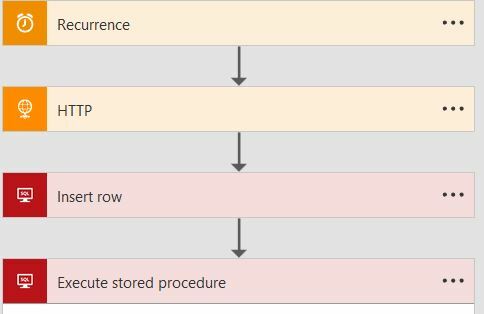 At present neither stored procedures nor triggers are supported when dealing with Microsoft SQL Databases via the On-premises data gateway. Challenge lost at least for the moment.